I tested this pattern so I could provide a picture of the finished item and was very pleased with how easy it was to fill into a nice round shape, and how simple it was to knit. It would make a great bazaar item as it can be made from very small scraps of yarn. The picture shows my sample knit with 8 ply (that’s DK to all you non-Aussies) with size 12 (3mm) needles. The finished ball was approximately 15cm (6 inches) in diameter. I used ordinary polyester toy stuffing as the filling. There are 12 sections and each one has five sides. Use a different colour for each piece. Scraps of 8 ply (DK) yarn, 12 ply (chunky) yarn , or thinner yarn used double, in several bright colours. 1pr of size 12 (2.75mm) needles (for DK or doubled yarn), use a slightly larger size for chunky. Cast on 11 sts and knit into the back of each stitch in the first row. Working in garter stitch throughout (knit every row), knit three rows, then increase at each end of the next and every 5th row until there are 17 sts. Knit six rows without shaping. Now decrease by k2tog at each end of every alternate row until reduced to 5 sts, k2tog at each end of the next row, then knit the remaining 3 sts together and fasten off. When all 12 sections are completed, press them lightly. Care must be taken to join the sections (which is done by buttonhole stitching together with the black thread thus: Stitch five sections round a central one, making six in all, then join up the remaining edges so that you have a cup shape. Make up another six sections in the same way, then fix the two halves together and stitch, leaving a space through which to insert the stuffing. 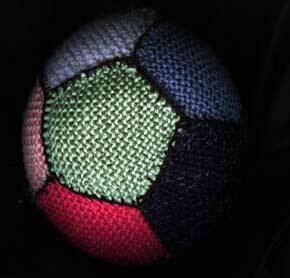 Stuff the ball lightly, holding it in the hands and molding it to a good circular shape, then sew up the opening with black buttonhole stitch. This pattern is in the public domain. This digital version of this pattern is Copyright © Sarah Bradberry June, 1998.